When the human mind experiences great trauma, it will sometimes lapse into comforting delusions as a maladaptive means of self-protection. This appears to be what Mike Pence’s mind has done after six days as Donald Trump’s running mate. In less than a week on the mogul’s ticket, Pence has heard himself introduced to the song “You Can’t Always Get What You Want,” seen himself demeaned on national television, witnessed his party’s convention derailed by an unfathomable plagiarism scandal, and had his RNC speech upstaged by a chaotic spectacle his campaign had every opportunity to avoid — all while having to continuously adapt himself to the whims of a volatile sociopath. It seems these pressures have proven too much for the Indiana governor to bear. On Thursday morning, a visibly psychotic Pence went on Fox & Friends and described a “Donald Trump” and “Republican National Convention” that only he can see. 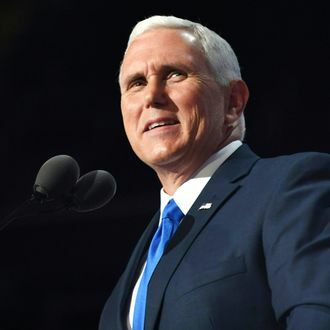 “What I hear from Donald Trump is that we’re going to stand strongly with our allies,” Pence said Thursday, eyes wide and shimmering with madness. Twelve hours earlier, Ted Cruz refused to endorse Trump, imploring delegates to “vote your conscience,” even as the crowd chanted demands for a formal embrace of the nominee. His wife was then escorted from the hall by security amid a torrent of verbal abuse.